Receive a draft test report within two (2) weeks following the completion of field work or within two (2) business days following receipt of laboratory data. Put The Alliance Advantage to work for you. Stop waiting on your stack tester… Get it now, get it done, know it’s right! Your stack test is too important to leave to chance. Don’t sit around and wonder if your phone call will be returned, if your test plan was filed, or if you will meet an important compliance deadline. 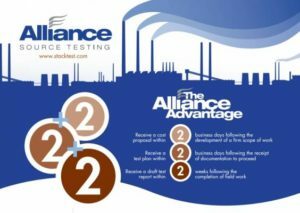 We respond and our response is measurable through The Alliance Advantage. Put The Alliance Advantage to work for you. Prompt response to stack testing proposal requests and followup sets us apart! With a sole focus on providing the best stack testing services, we are able to provide unparalleled customer service. Our sole focus on stack testing makes Alliance Source Testing unique from others who provide air emissions testing among a laundry list of other services.